Welcome to Diamond State Golden Retrievers! I live in a quiet neighborhood in North Wilmington, Delaware. My dogs are pets first and foremost. I am committed to breeding Goldens that can compete successfully in conformation, agility, and obedience. My dogs are bred for health, beauty and the fabulous temperaments for which Goldens are famous. They are truly my family. My first pet was a Golden Retriever, Erin. She lived with me for almost 21 years which is unheard of, even my Vet could not believe it but he had all of her paperwork since 8 weeks old. After Erin, all I wanted was more Golden Retrievers. After researching the breed on-line, I found and fell in love with European Golden Retrievers. Until AKC recognized Golden Retrievers, in the 1920’s, the American and European Golden Retrievers were the same, but over the years the two standards have gradually changed in different ways, most notably the color. Many call them English Cream Golden Retrievers, but in reality the European style can be any shade from cream to golden. There are studies that indicate that the European Goldens might be genetically healthier than their American counterpart. According to studies done by the Kennel Club in England and the Golden Retriever Club of America, the cancer rate in American Goldens is 62% and 38% in European Goldens. Quality puppies are produced by evaluating the strengths and weaknesses of each dog and matching dogs so that the weaknesses of one dog are improved by the strengths of another. Although I think my dogs are incredible, I do realize that there are no perfect dogs. There is always room for improvement and improving is my ultimate goal. Every puppy will receive all the love, attention, socialization, and training as a foundation for a sweet, loving, and easy to live with pet. 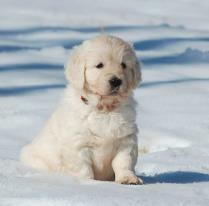 I breed Golden Retrievers for health, temperament, and standard Golden Retriever structure. Before I breed a litter, both parents must be certified for hips, elbows, eyes, and hearts. I only breed dogs with temperaments that are true to the typical Golden Retriever temperament: friendly, intelligent, outgoing, gentle, good with children, and sweet. I will communicate with you about the parents and also about the developing personalities of the puppies so you will be better equipped to get a puppy with the temperament that best suits your family. I love the big blocky heads, the dark eyes, nose, and pigment, and the fuller coat that most people will notice right at the start. But there are many other things that will make a dog stand out as beautiful that are all proven by a qualified judge’s evaluation at a conformation show. Conformation, agility and obedience titles are the proof of a well put together, intelligent and beautiful dog. Puppies are born in a room in my house specifically set up with a whelping box for puppies and a couch for me to spend the first week with them. Someone is with them around the clock to ensure that each one is thriving and doing well. During the second and third weeks, mom is primarily taking care of the puppies, but there is still much to do. Every day bedding is changed and washed, the puppies are weighed, and the puppies are picked up and snuggled and loved many times a day. At 3 weeks, the puppies are moved so that they can be exposed to all the sights and sounds. They continue to spend time in their whelping box, but a weaning pen is also set up adjoining the box. This gives them more room to develop and play. They are given all kinds of toys, introduced to solid foods, and their time with mom is gradually reduced. Between 3 weeks and 5 weeks, I will spend a lot of time in the pen petting and loving the puppies. After 4 weeks I will have family, including children, who love to sit, hold, and pet the babies. By 5 weeks, the puppies are old enough to start house training, be introduced to a crate and a leash, to begin learning to come when called, and to start becoming adjusted to being separated from their mom and littermates for short periods of time. During these last 2-3 weeks that the puppies are with me, they are a full time job. I remove the whelping box and set up a large indoor pen. I work with them on crate training and learning to be confident without their littermates. I will take them outside often to do their business, take them on car rides, socialize them with a variety of people, expose them to noises and sights of all kinds, and do temperament testing. The huge amount of time spent with puppies makes a huge difference! Puppies go to their new homes at 8 weeks. Our job does not end when the puppies are gone. I will be here for support for the life of each puppy/dog, available to answer any question by phone or email. We would love to periodically hear how each puppy/dog is doing and receive pictures as he/she grows up. Our companion puppies are sold on AKC limited registration and spay/neuter contracts since they are companions/pets and should not be bred. All our puppies are sold with a written agreement and to APPROVED HOMES only. I do keep a waiting list for litters that we are expecting. I require a deposit once pregnancy is confirmed (about 28 days after breeding). If you still would like a puppy at that time, I then ask for a $500 deposit to hold the puppy until 8 weeks so I know how many puppies are definitely spoken for. 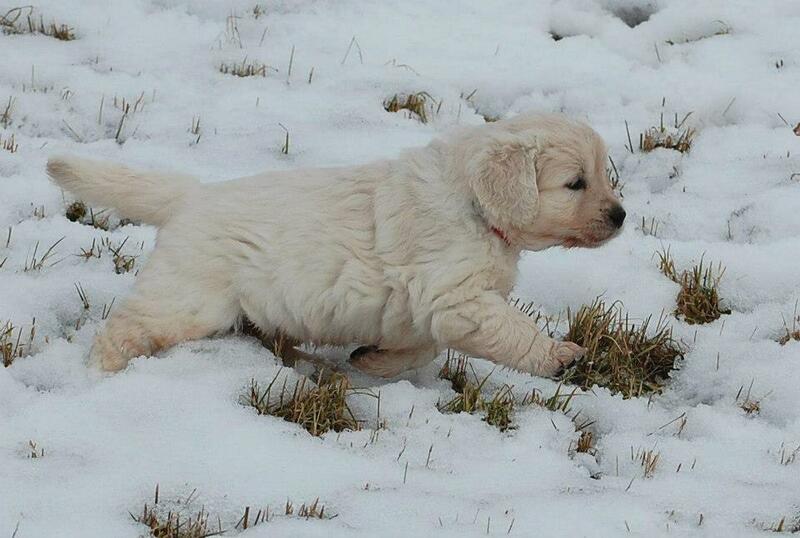 A deposit is a firm commitment and will only be refunded until puppies are 4 weeks old. I hope you will agree that the animal's welfare must be my foremost consideration in considering a placement. Please return this form when completed via my email at laiwilm@aol.com if you have an interest in a puppy.